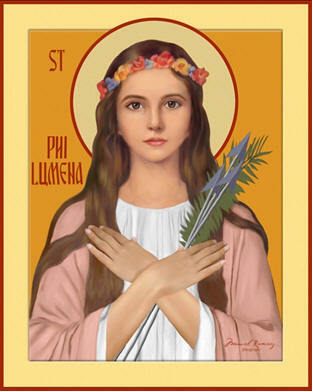 Saint Philomena, New Light Of The Church Militant! The rude latter days are here. They are clearly and universally marked by occultism, modernism, materialism, spiritism, despair and a general falling away from the Faith. Never have the powers of darkness been so strong since the beginning of Christianity, as they are today. Saint Philomena is the NEW LIGHT of the CHURCH MILITANT! Every Pope since the death of the saintly Curé of Ars, has spoken formally to priests throughout Christendom exhorting them to: imitate the spirituality of the Curé in every aspect. The very name of Philomena contains the words: FILIA LUMINIS, Daughter of Light. She is the enlightener of a dark and corrupt Age confounding the sneers of materialism. She is the Patroness of the Children of Mary. Her mission, today, is to draw us to the Immaculate Heart of Mary through imitation of her heroic virtues of purity, obedience and humility. Saint Philomena is an anchor of HOPE in this Dark Age of despair. The possession of grace is the foundation of peace and happiness. Saint Philomena will obtain for us a vast increase in grace through our participation in her Spiritual Family of the Universal Living Rosary: imparting to us hope which will increase our joy which, in turn, will give us the strength we need to be faithful to Jesus Christ even unto death, that we may obtain our eternal reward. Let us pray to her with all confidence and do everything in our power to share her devotion with as many others as possible. This is her delight that God may be glorified in time and Eternity! Saint Philomena was formally “raised to the Altar” by Pope Gregory XVI in an infallible statement made publicly in the name of Holy Mother the Church for the edification of all the faithful and for the glory of God in time and Eternity. “…To discredit this decision and declaration concerning Saint Philomena as not permanent, stable, valid and effective, necessary of obedience and in full-effect for all eternity, proceeds from an element that is null and void and without merit or authority,” states the great enemy of modernism and defender of the Faith, Pope Saint Pius X, Patron of Youth (1912). This great Pope sent his own ring to be placed on the finger of Saint Philomena at Mugnano. Saint Philomena is the Saint for the whole world! Everywhere her miracles are dazzling and easily granted; everywhere she shows that her distinguishing characteristic is sympathy with need and distress of every kind. Spiritual graces, temporal blessings, help in financial difficulties, success in business and work, cures of the most marvelous kind – especially when her holy oil is used and her cord worn as a sign of confidence in her protection; consolation for unhappy households – all these are the favors she obtains for her clients. Her prayer is powerful with God! There is no class of people she does not help in a very particular way. She is the special patroness and protector of youth, she loves children with a very special affection; her patronage is wonderful in the needs, spiritual and temporal, of priests, monks and nuns; to the sick she is ever compassionate, toiling house-mothers find her kind and thoughtful in an exceptional way; she is the Patroness given by the Holy See itself of the Children of Mary and the Living Rosary; the cause of religious education is one very dear to her; she is a Saint who particularly loves the Foreign Missions and the making of converts; she gives the grace of happy births and helps the barren; to her, many owe the blessing of returning to the Sacraments and a happy death; she obtains help for the scrupulous, and money and food for the poor and needy. Our beautiful Saint Philomena went forth from her mother’s arms to die for Christ; the lictor’s axe cropped the budding lily, and pious hands gathered her up and laid her in the tomb. This true heroine trampled all the vanity of the world under her feet and chose to endure multiplied torments rather than renounce her vow to Our Crucified Savior. What a model of constancy and of every virtue! Let the youthful take heart and go to her when tried. Let us all, with unbounded confidence, implore her intercession! The enemy of all souls is deceiving man that he can make peace and reconciliation with those who raise themselves against God. The devil is working feverishly for the total demolition of God’s Kingdom in the hearts of the little ones. We cannot become partners or accessories to his crime. The Commandments of God must be made known to every living person, and each generation must be taught to obey them. Much of what is taking place, now, under the banner of ‘aggiornamento’ is nothing but an attempt to undermine the Dogmas, laws, institutions and traditions of the Church in accordance with the mentality of the world. Christianity is adjusting God’s Commandments to human weakness instead of endeavoring every day with a contrite heart to raise man up from sin to God. THE CHURCH IS IN PERIL! Saint Philomena is God’s GIFT to the modern world. New Light of the Church Militant, she has come to pour balm on our wounds, light our lamps and enkindle in us the fire of Divine Love. St. Philomena has come to us, that her glory and power with God may be our anchor of HOPE! The character of sanctity is hopefulness. God is more than able to cope with any evil. Like Saint Philo-mena, we must offer ourselves to God, and He will use us. There are very few apostles today and the whole world is arrayed against them, but they have God with them and the victory is theirs. We must have absolute TRUST IN GOD! Never was there anyone so sensitive to kindness or gratitude as Our Lord. If you want a big grace, begin by thanking God over and over again for the small details of life. If you have done only a wee favor for a friend and he is deeply grateful for it, how this touches your heart! What is lacking in our spiritual life is hope and confidence in God! We believe that, morning after morning, God gives us His own Body and Blood in the Holy Eucharist but, later in the day, when asking a small grace of Him, we fail in our hope of receiving it. St. Philomena emerges from the catacombs after a long rest, to give us a great and lively hope in obtaining all things from God. Hope gives birth to joy and joy gives strength to the soul. May we successfully complete our mission upon earth and arrive safely in Heaven to glorify God for all Eternity! Let us not confine ourselves to asking benefits of Saint Philomena; but let us by imitating her virtues, render ourselves worthy of the enjoyment of her favors. We must not wish to share in her joy without first sharing in her sufferings. Are you anxious to interest Saint Philomena in your cause? Meditate on her virtues, take part in her Living Rosary, remove from your heart all vices and defects, and do all that you can to give her to souls that she may help them. To the Associates, then, of a society which, beside its paramount devotion to the Infinite God-made-Man, cultivates a special affection towards His virgin-martyr glorified with the gift of miracles, we offer this basket of spiritual roses. May the Little Company of the Blessed Sacrament and Saint Philomena, its heart in a silent chapel of Perpetual Adoration, increase and multiply! Forgive, O my God, my past folly! my prayers and desires! Amen. This entry was posted on Saturday, May 26th, 2012 at 6:28 pm and is filed under NewsFlash, Saint Philomena. You can follow any responses to this entry through the RSS 2.0 feed. Both comments and pings are currently closed.